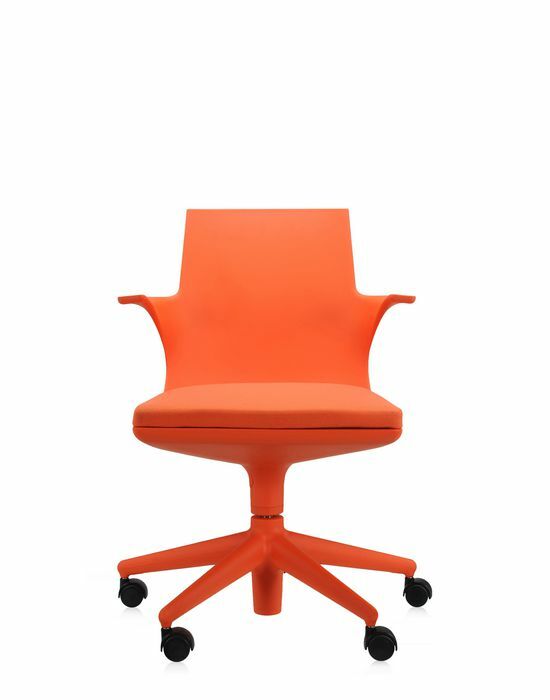 A monoshell light office chair on castors, Spoon Chair is the result of a totally avant-garde production process. The innovative dual-component injection moulding technology used to produce this chair creates a “layered” product. Two different thermoplastics are moulded at the same time, one for beauty (exterior) and the other for its high mechanical resistance, giving Spoon Chair its highly technological characteristics and maximum flexibility. The latter is a result of its highly customisable thickness, which adapts to the user’s weight. The easy-to-use handle regulating the mechanism is concealed inside the trunk of the bottom shell to avoid interrupting its sinuous line. Ideal for offices, a fireproof version of the Spoon Chair is also available.